(1) Main Event: DX (Triple H & Shawn Michaels) beat Chris Jericho & Big Show in a TLC match to capture the Unified Tag Titles. (2) First Time: Sheamus captured his first career WWE Title from John Cena in a tables match. (3) Semi-Main Event: Randy Orton beat Kofi Kingston at the peak of their feud following Kofi's "Boom Drop in the Garden." (4) Smackdown Main Event: The Undertaker beat Batista to retain the World Title. (5) ECW Title Match: Christian beat Shelton Benjamin in a ladder match to retain the ECW Title. (6) IC Title Match: Drew McIntyre beat John Morrison to capture the IC Title. (7) Women's Title Match: Michelle McCool beat Mickie James. (8) Roster Turnover - Wrestlers No Longer On WWE Roster: Shawn Michaels, Chris Jericho, Batista, Shelton Benjamin, Mickie James. (9) Roster Turnover - Wrestlers On 2009 PPV Also Booked For 2010 PPV: John Cena, Sheamus, Randy Orton, Kofi Kingston, John Morrison, Michelle McCool. (10) PPV Announcers: Michael Cole, Jerry Lawler, Matt Striker. -The opening video showed a variety of chairshots and big bumps with narration such as "the jolt of solid steel" and "excruciating pain that awaits." Michael Cole asked viewers to prepare themselves for an unpredictable evening. He referred to TLC as a "revolutionary pay-per-view." Cole was shown at ringside with Matt Striker and Jerry Lawler. Looks like we'll have the same three-man team throughout the PPV again, with Todd Grisham and Josh Matthews sidelined due to lower seniority. Striker threw random facts as us such as the ECW Title has never changed hands in Texas," Christian has been in seven out of three dozen ladder matches in WWE history, Shelton has been in four. Christian went for his Unprettier finisher at 2:00, but Shelton countered. He then went to ringside to get a ladder, but Christian pursued him from behind. He threw Shelton against the ringside security railing. Shelton, though, recovered and whipped Christian into the security railing, too. A minute later Christian flew over the top rope onto Shelton at ringside. He brought a ladder into the ring and nearly got to the belt, but Shelton yanked him down. Christian used a catapult, but it actually sent Shelton toward the ladder, which he climbed. Christian yanked him off the ladder a second later and threw him to the floor. He thought about climbing the ladder, but shook his head and instead grabbed the ladder to use as a weapon. From ringside, Shelton yanked Christian's legs out from under him. Christian fell backward and the ladder landed on him. As Shelton beat on Christian at ringside, Christian began bleeding heavily, apparently from the ladder landing on him. A medic at ringside tended to him at 5:00. Shelton punched Christian, so the ref moved in and told him to back off. Shelton said the Texas State Athletic Commission requires a bleeding wound must be tended to. Lawler jumped in and said that's not just Texas, that's WWE's policy. Christian got up and yanked Shelton off a ladder and into the front row. Shelton came right back and climbed the ladder. Christian met him on the other side. Shelton knocked him to the floor. Shelton somersault leaped onto Christian on the floor. The ref moved in to get a signal from bot that they were okay, then backed off so they could recover and move forward in the match. Christian bridged a ladder over the apron and ring barrier. Shelton tried to catapult Christian, but Christian kicked him into another ladder. Lawler said the wrestlers weren't just in danger, as everyone in the arena was at risk. Back in the ring at 8:00, Shelton whipped Christian into a ladder propped in the corner. When Shelton charged again, Christian threw the ladder at him in mid-air. Christian climbed a ladder. Shelton knocked him down and then hit him with a spin wheel kick to the face. He leaned a ladder against the top rope and yanked Christian into it a few times, then knocked them both over. Christian followed Shelton up the ladder, then slammed him down to the mat. Christian began t climb a ladder, but he noticed Shelton climbing the top rope. Christian shoved the ladder toward Shelton, but Shelton climbed the ladder and tipped himself toward the belt. He almost grabbed it, but Christina tipped him back. Shelton then tipped himself off the ladder and clotheslined Christian. Christian rolled to the floor. At 13:00 Shelton reached for the belt. Christian returned and stopped him. Then Shelton powerslammed Christian off of the ladder onto the mat. There was a time where a standard powerslam could justify a pinfall, but now it's a transition move into another ladder spot. As Christian got up and leaned a ladder in the corner, Shelton gave him a Stinger splash from behind. Christian climbed another ladder and grabbed the belt. Christian pulled the ladder away, leaving Shelton hanging from the belt. Christian decided what to do. The first ladder wasn't tall enough, so he got the taller ladder. Christian went after Shelton and knocked him down. He then tried to unsnap the belt himself. Shelton grabbed Christian's legs, yanked him down, caught him from mid-air, and rammed him into a ladder leaning in the corner powerbomb-style. At 16:00 Shelton tried to sunset flip Christian off the ladder, but Christian turned the momentum into a leg scissors sending Shelton into the corner. Shelton tried to suplex Christian off the ring apron. Christian blocked it and knocked Shelton backward onto a ladder bridged at ringside. Christian climbed to the top rope and leaped off onto Shelton, who had to lie there unreasonably long considering a few seconds earlier he had the strength to nearly back suplex Christian off the apron. It was as unrealistic a move as there was in the match; unfortunately, because the bump itself was quite the visual with the ladder itself snapping in half. Christian then entered the ring, climbed the ladder, and unsnapped the belt. Lawler said both men deserved to win. Christian's face had dried blood on it. Medics were checking on Shelton on the floor. WINNER: Christian in 18:00 to retain the ECW Title. STAR RATING: ***3/4 -- Good opening match. Good use of the ladder. It's way too much put into one match in terms of major spots that they didn't have time to sell, so it's short of four-stars for that reason. But by design, it was meant to be a video game consequence free type of violent spotfest, and that it was. At 1:00 they went to ringside. Morrison charged McIntrye, but McIntrye ducked and shoved Morrison into the ringpost. McIntrye rolled Morrison into the ring and scored a two count. McIntrye settled into an armbar at 3:00. Morrison teased a comeback, but McIntrye kicked him in the face and then settled into another armbar. It looked like he was really twisting Morrison into a painful position incorporating a chinlock too. Morrison hit a twisting DDT counter that looked really good. Both were slow to get up at 6:00. Morrison got up and scored a few two counts including after a top rope dropkick. McIntrye came back with an inverted Alabama Jam for a near fall. They fought at ringside for a minute where Morrison controlled offense. Back in the ring McIntrye took a cheapshot at Morrison's eyes and then gave him his Scot-Drop double underhook DDT for the win. Cole asked Lawler if McIntrye is "The Chosen One." Lawler said so far, so good. WINNER: McIntrye in 10:00 to capture the IC Title. STAR RATING: **1/2 -- Good ten minute match. Nice break from the crazy videogame spotfest action that will otherwise fill this card. -A commercial aired for Monday's Slammy Awards. Then they showed some U.S. soldiers at ringside. -Backstage Vince McMahon was chatting with McIntrye. Matthews asked if he could have a word with McMahon. McMahon told him to talk to McIntyre. Matthews asked if he's surprised he won a major singles title so soon in his WWE career. McIntrye said he's not surprised. He said it was the inevitable coming to fruition. He said when McMahon sent him to Smackdown, he knew what he was capable of. Sheamus walked into the picture and told him his win was pretty impressive. He said he wouldn't be the only newcomer leaving TLC with gold. They aired the video McCool made making fun of Mickie for supposedly being overweight. Layla wore a "Piggy James" t-shirt. Cole said nobody likes to be made fun of, especially for their weight. The correct thing for Cole to say is what Lawler said: "If you think Mickie James is fat, you need to go to an eye doctor. Mickie James is hot." Good for him. Someone had to finally say it. Striker said because McCool won both the Divas and Women's titles, she's a shoe in to be a Hall of Famer. Cole gasped and said she's only been around about five years. Striker said she's accomplished more than Wendi Richter or Leilani Kai. They had a hair pulling battle at 1:00. Mickie went for a quick leverage pin for a two count. She continued aggressively with two more pin attempts. Striker touted McCool's master's degree from Florida State University. Lawler asked what one does with such a degree, put it in a car window so you can park in the handicapped spots? McCool took over offense for a couple minutes. At 5:00 McCool battled James at ringside, throwing her into the ringside barrier. Mickie side-stepped McCool and went on an offensive flurry including an Thesz press. Back in the ring she hit another Thesz press leading to a two count. When Mickie climbed to the top rope, Layla shoved her down. Mickie landed on her feet, then turned and kicked her in the gut. McCool went for a big boot against Mickie, but Mickie moved and the kick hit Layla, sending her to the floor. Mickie went for a schoolgirl on McCool, which got a two count. McCool fired right back with a kick to the face for the win. STAR RATING: **1/4 -- Good for WWE giving the Women's Title match nearly ten full minutes to have an actual full-fledged match. -A lengthy video package aired on Sheamus, which is a good idea since many PPV viewers may not be Raw viewers or even necessarily watch a lot of WWE TV if they're part of a PPV party gathering, so the backstory is good. They showed the cover of an Irish newspaper with Sheamus on the cover predicting victory tonight. Cole said the last time a WWE Champion was born outside of the United States was 16 years ago when Yokozuna held the title. Cena went after Sheamus at the bell aggressively including two head rams into the turnbuckle. Sheamus caught Cena with an elbow to the chest as he charged him in the corner. Sheamus took over at ringside, throwing Cena shoulder-first into the ringpost. Cena returned fire, whipping Sheamus into the ringside steps. Lawler predicted color being added to the white body of Sheamus before the end of the match. Cena put Sheamus face-down on a table, then climbed to the top rope. Sheamus moved. Cena chased Sheamus back into the ring, but Sheamus caught him and stomped away at him aggressively. Sheamus punched away at Cena on the ring apron. Cena held onto the top rope. The crowd might not have understood the rules as they didn't pop or gasp at him nearly falling backwards through it. Cena surprsed Sheamus with an Attitude Adjustment attempt at 6:00, but Sheamus escaped. At ringside Sheamus took over on Cena, including throwing him head-first into the ringside steps. Cena lifted Sheamus for an Attitude Adjustment, but Sheamus slipped out and tried to powerbomb Cena through the table. Cena blocked that. They brawled up the ramp. Cena suplexed Sheamus. Cena tried to slam a table onto Sheamus, but Sheamus moved. Cena then went after Sheamus aggressively again, dragging him back into the ring. Cena pulled a table out from under the ring. Striker recommended buying Home Depot stock with all of the tables around the ring at this event. Cena took long enough to enter the ring that Sheamus caught Cena in the face with a big boot at 11:00. Sheamus brought a table into the ring and leaned it in the corner. He lifted Cena to slam him through the table, but Cena powered out and went for an STF. He followed with two flying shoulders and a side slam. Then came the You Can't Seen Me routine, popping a segment of the crowd. He hit the Five Knuckle Shuffle. Sheamus got up and threw the table out of the ring to avoid being slammed through it. Cena gave Sheamus an Attitude Adjustment. Sheamus was down and not moving at that point. Cena took his time folding the legs of a table at ringside, sliding it into the ring, and then setting it up in mid-ring. He lifted Sheamus to put him on the top turnbuckle and set him up for an Attitude Adjustment off the ropes. Sheamus fought out of it and shoved Cena to the mat. Cena tried again, this time a superplex. There were some boos from the crowd aimed at Cena's offense. After a long set-up where Cena seemed like he wasn't going to keep his balance, Sheamus shoved him off the top rope and also fell to the floor himself. Cena crashed through the table, giving Sheamus the win. Cole said he was in shock. Cena was slow to get up as two referees checked on him. Sheamus celebrated and then returned to the back with the belt in hand. Striker said around the arena there were jaws wide open expressing disbelief. STAR RATING: *** -- Good match, although there were some real slow spots involving getting tables set up or moved into the ring. Sheamus looked like he belonged out there in that he hit his spots and carried himself as a main eventer, but whether the fans bought him as a top tier act isn't clear yet. They did a good job playing up the stunned silence of the crowd as Cena returned to the back. -A video aired hyping the Tribute to the Troops special on NBC next Saturday night. -They went to ringside with Cole, Lawler, and Striker discussing whether Sheamus's win should be considered a huge upset. When watching a replay, Lawler wondered if Cena lost his balance or Sheamus shoved Cena, contending that if Cena just slipped and fell through a table, that might not count. Striker said it doesn't matter because Sheamus is the champion. Lawler thanked Switchfoot for "Bullet Soul," the theme song for TLC. It's interesting that WWE has put the two world title matches on before the tag title match and Randy Orton vs. Kofi Kingston. Taker gained control early after stopping Batista from using a chair in the opening seconds. Several chairs were set up at ringside. Cole clarified that chairs can be used, but other objects or weapons could not legally, so the match could end by DQ, but otherwise would end by pinfall or submission. Batistas hit a clothesline at 1:00 for a short two count. At ringside, Taker tossed Batista over the security railing near the fans. Taker went for a big boot, but Batista moved and Taker straddled the security railing. Batista hit Taker across the back with a chair, the first chairshot of the match at 3:00. Batista swung a chair at Taker against the ringpost, but Taker moved. Taker hit a guillotine legdrop a minute later. Cole called it "vintage Undertaker." Lawler and Striker ribbed Cole over that signature term "vintage." Batista knocked Undertaker off balance on the top rope and then hit a superplex. Both were slow to get up. Batista went for a Batista Bomb on a chair, but Taker backdropped out of it. Batista came back with a spinebuster for a near fall at 7:00. Taker fired back with a flying clothesline. He sat up, grabbed Batista's arm, and walked the top rope. Cole said, "Old school from the Undertaker." Taker followed up with a snake eyes, but Batista countered with a spear for a two count. He followed with a spinebuster on a chair, then stomped the mat, which drew boos. As he reached down for Taker, Taker surprised him with a Hell's Gate submission hold. Batista flailed his right arm and then eventually reached the bottom rope to force a break. Batista surprised Taker with a jab to the chest with a chair. Taker came back right away with a flying clothesline for a two count. Taker signaled for a chokeslam and hit it, good for a two count. With the ref's back turned, Batista gave Taker a low blow. Batista picked up a chair and swung at Taker. Taker lifted a hand, but collapsed upon impact, and Batista scored the pin. As Batista celebrated, Smackdown G.M. Teddy Long walked out and said, "No, no, no." He said use of a chair is legal, but a "blatant fowl" is not. He called what Batista did a "low, despicable act." He said he wouldn't let it stand. He ordered the match to re-start. The ref rang the bell. Taker sat up. Batista charged at Taker with a chair, but Taker kicked the chair into Batista. Taker hit Batista in the back with a chair, then gave him a Tombstone for the win. WINNER: Undertaker in 15:00 to retain the World Heavyweight Title. STAR RATING: **1/2 -- Overall, just okay excitement-wise. Not bad, but not dynamic or particularly memorable or dramatic. It's about what you'd expect these two to product, though, and they did enough to make it crowd-pleasing match. Nice to see such limited use of the chair in the match and not blatant head shots with the chair. Yet I doubt anyone in the crowd was complaining. The Long decision sets up PPV rematch or even a big TV rematch for Batista. -A commercial aired for the January Royal Rumble. They went to Lawler, Cole, and Striker at ringside touting the Orton-Kingston match. Then they threw to a video package recapping the feud. -Backstage Kingston was warming up. Cody Rhodes and Ted DiBiase approached him. They told him to relax because they were going to beat hi down, they'd let Orton do that. Kingston said he won't let them intimidate him. He called them Orton's sidekicks. DiBiase said he's never been in this position - one-on-one against someone of Orton's caliber. Haven't they wrestled each other before? Anyway, DiBiase said Kingston is terrified on the inside. Kingston walked down the hall into Orton's locker room. He told Orton that he doesn't deserve a title shot ever again and he's looking forward to beating him down tonight. Kingston looked at DiBiase and Rhodes as if to tell them that move proved he isn't intimidated. -They showed scenes of San Antonio's river walk. Orton got his obligatory side headlock out of the way very early, going to it immediately at the start of the match. After a powerslam at 1:00, he applied his obligatory chinlock. Kingston surprised Orton with a roll-up at 2:00. Kingston ran in place, drawing some boos, and signaled for his "Boom Boom" sequence. Orton rolled out of the ring. Kingston leaped off the top rope at Orton, but Orton caught him with a dropkick. Orton dominated offense methodically for several minutes in the ring. At 8:00 Kingston clotheslined Orton over the top rope to the floor and then dove at him at ringside, knocking him down with a shoulder tackle. Back in the ring Kingston scored a two count after a flying bodyblock. Orton fired back with a backbreaker. At 9:00 Kingston hit Trouble in Paradise for a near fall, stopped when Orton grabbed the bottom rope. Orton then gave Kingston an implant DDT off the second rope. Orton waited for Kingston to rise onto his knees. Orton went for the punt kick. Kingston blocked it with his arm, but then sold serious arm pain. Orton drove his arm into the mat DDT-style, then licked his lips and rolled his eyes back as if he really enjoyed that moment. He then pounded the mat and set up his RKO. Kingston went for Trouble in Paradise out of nowhere, but Orton ducked and hit the RKO for the clean win. There was a significant minority pop for Orton's win. STAR RATING: **1/2 -- Good match. Above-average, but not a classic show-stealer or anything. -Backstage, Batista chewed out Teddy Long. Batista said he was robbed and he must make it right or else he'll swing a chair at his head. Long cowered and the camera stayed on him an uncomfortably long time. During the DX ring intro, Striker said he's still in shock over Cena losing the WWE Title. After some pushing and shoving, Show fought at ringside with Triple H as Michaels took control of Jericho in the ring. Hunter side-stepped a charging Show, who flew over the security railing into the front row. At 4:00 Michaels tried to suplex Jericho onto a table at ringside. Jericho blocked it. Back in the ring Jericho went for a Walls of Jericho. Michaels powered out of it and hit an inverted atomic drop. He followed with a top rope elbow drop attempt, but Jericho lifted an elbow and caught Michaels with it. Jericho charged at Triple H on the rampway and swung a chair. Hunter avoided it and set up a Pedigree. Jericho backdropped out of it. Michaels tried to make the save, but Jericho punched him. Michaels retreated behind the entrance set. Lawler wondered where he went. He came back with a chair. Jericho and Michaels had dueling chairs, with Michaels knocking Jericho's out of his hands. He jabbed Show in the cut with a chair, then hit Jericho across the back with it. Show stopped Michaels with a headbutt. Jericho and Show walked back to ringside. Jericho entered the ring and watched Show slide a huge ladder between the ropes. Michaels and Hunter caught up to them. Hunter took over on Jericho in the ring, including using the ladder as a battering ram. At 10:00 Michaels and Hunter suplexed the ladder onto Jericho's back. That popped the crowd, which had been largely silent for most of this methodically paced match with a lot of walking between the ring and the stage. Michaels climbed the ladder. Show punched Hunter as he returned to the ring and yanked Michaels to the mat. Show went after Hunter in the corner with a barrage of punches as Jericho went after Michaels with a ladder. Jericho slidekicked the ladder into Michaels, sending him to ringside. Show and Jericho then double-teamed Hunter. Jericho gave Hunter a bulldog onto the ladder. They hung Hunter upside down in the corner with his legs caught in a ladder. Michaels tried to come to Hunter's defense, but Show reverse-whipped Michaels into the Triple H. Triple H reverse-whipped Jericho into the ladder a minute later. Show looked at Hunter as he stood. Hunter side-stepped a charging Show and then swung a ladder at him. He threw the ladder onto the Jericho at ringside, hitting the back of his head and maybe the most dangerous looking spot of the night consider Jericho's back was turned. Hunter turned a chokeslam attempt into a DDT. Michaels returned with a flying elbow that hit Show. Michaels went for a superkick on Jericho, but Jericho turned it into a Code Breaker. Hunter surprised Jericho with a spinebuster. Show then surprised Hunter with a spear. The crowd chanted, "HBK, HBK," their hometown star. With everyone else knocked out, Show set up a ladder mid-ring and climbed it tentatively. Hunter entered and hit Show in the back with a chair. That seemed to just upset Show, who countered by punching the chair into Hunter's face. Hunter down fast. Show again climbed the ladder. Michaels tipped it over, sending Show onto the top rope. Michaels helped Hunter slam Show to the mat with a Pedigree. Michaels climbed the ladder and almost grabbed the tag belt, but Jericho tipped him over onto Show at ringside. Jericho then climbed the ladder and grabbed the belt. Hunter intervened, but Jericho shoved him to the mat. Hunter went back at him and powerbombed him to the mat. Cole said he had goosebumps. (TMI.) Show re-entered the ring to stop Hunter from climbing the ladder. He chokeslammed Hunter to the mat at 19:00. Show tipped the ladder over and began destroying it. Then he threw Hunter against the ropes and into the corner, where he punched him several times. Jericho slid a ladder into the ring. They sandwiched Hunter and Michaels in the ladder and smashed them. Show yanked the ladder in half. Lawler wondered if there'd be a ladder left to climb. Again, the crowd was watching in "silent interest." A "We Want Tables" chants began as Show knocked Michaels to the floor. He chokeslammed Michaels into Hunter and both crashed through a table at ringside. Meanwhile, Jericho tried to climb the half ladder. He couldn't balance it, so he had Show put him on his shoulders. Show walked toward the belt with Jericho standing on his shoulders. He reached for the belt, but almost lost his balance. Hunter and Michaels re-entered the ring. Show and Jericho looked panicked. Michaels superkicked Jericho who was knocked over the top rope almost onto a table at ringside, coming up a bit short of the intended crash bump. Michaels and Hunter used the half-ladder to clothesline Big Show over the top rope to the floor. Hunter then held the half-ladder in place and told Michaels to climb it. It worked, as Michaels yanked the tag belts down for the win. STAR RATING: **3/4 -- Again, an okay match, borderline acceptable in terms of pacing and excitement for a PPV main event. While the crowd was never totally lost or out of it, they were often in that "silent interest" mode where they were watching and waiting, but not really reacting to big spots. They knew the finish wouldn't come until a big moment that was the culmination of near-grabs of the belt. At least temporarily, Michaels for the first time ever is a member of the Smackdown roster, or at least officially eligible to be on the show. He hasn't wanted to do Tuesday tapings in the past because of his Wednesday morning church activities that he'd have to miss. Matt Striker: "These are trained professionals. They have given their lives to sacrifice for our entertainment." Jerry Lawler: "Christian may be out on his feet. He's locationally challenged right now." Jerry Lawler: "If a metal ladder snaps in half like that, what keeps your bones from breaking?" Jerry Lawler: "Look at this list of countries. Manilla. I use their envelopes." 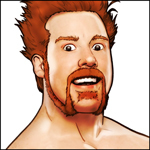 Jerry Lawler on Sheamus: "His white body reminds me of a corpse. I might like him better if he was one."